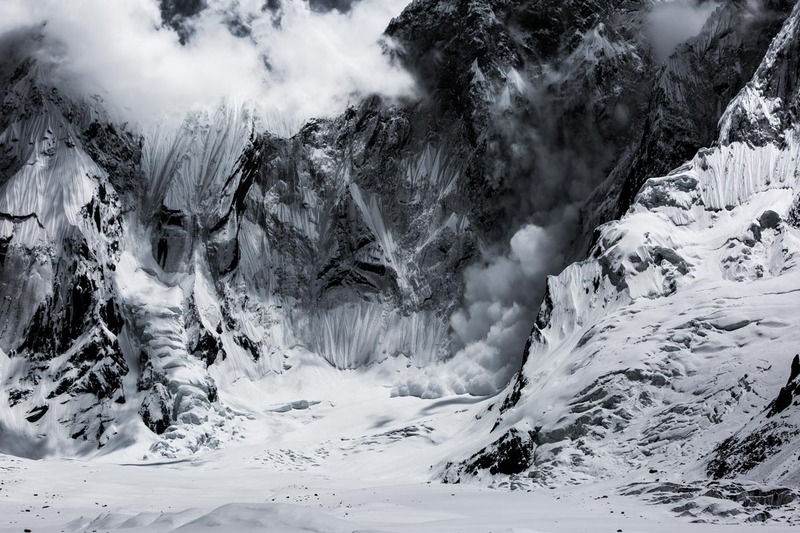 Last March I was astounded to receive an email saying that my image of an avalanche in the Pakistani Himalayas would be included in the Wildlife Photographer of the Year Exhibition. A dream come true! I had entered a few images from the Himalaya expedition and had heard that two of my images had made it through the first round of judging which was already more than I had hoped for, but to have an image selected as a finalist for the exhibition itself is huge honour. I have always looked forward to the Wildlife Photographer of the Year exhibition. It is one of the most prestigious wildlife photography competitions there is and each year includes stunning images by unbelievably talented photographers. Growing up in London the exhibition was an inspiration to me and fuelled both a fascination with Wildlife and a love of photography. I had always dreamed of seeing an image I had shot in the exhibition but the possibility seemed remote. ‘Enter the Wildlife Photographer of the Year Competition’ was top of my to-do-list every year, but every year I had it put off. Getting through several judging rounds amongst almost 50,000 entries just seemed like too much to hope for! align=”right”>’K6 Amphitheater’ – My other image that made it through the first round of voting. I actually prefer this one! 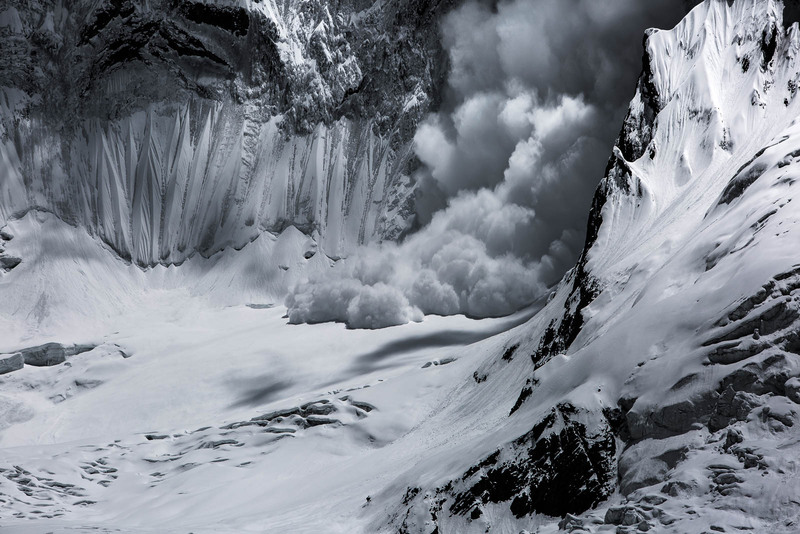 The image that made it in to the exhibition and is now on display at The Natural History Museum is of an avalanche thundering down the face of K6 in Pakistan. 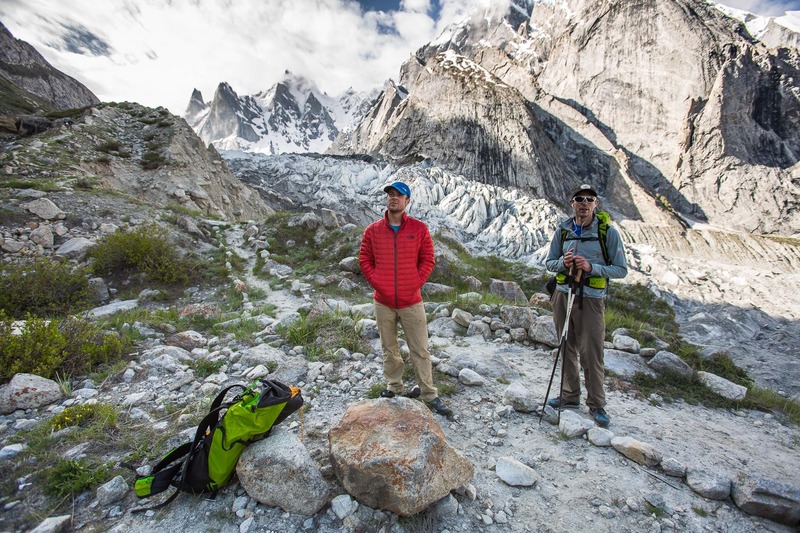 I shot it whilst on expedition with John Griffiths and Andy Houseman- two incredibly talented British climbers who were there to make an attempt on the previously unclimbed Link Sar. I was there to record the expedition and, hopefully, some of the ascent from a drone adapted to high altitude. Andy and John waiting for me yet again on the walk up to basecamp. I consider my self pretty fit but was shown up on this expedition! Shortly after arriving at base camp we were hit by unseasonably heavy snowfall. This was a real blow to the climbers as it increased the danger of avalanches on the north face where they were to make most of their ascent. The snowfall and avalanches did, however, make for some incredible scenes through my lens! The shots that I took of K6 were taken on a short sortie up the valley to check the snow conditions on Link Sar. While Andy and John were busy with checking conditions for the climb I was able to sit back and take some shots of the avalanches that were coming off the face of K6. Mist clearing from the face of K6 – the mountain sits at the head of the valley dominating everything around it. 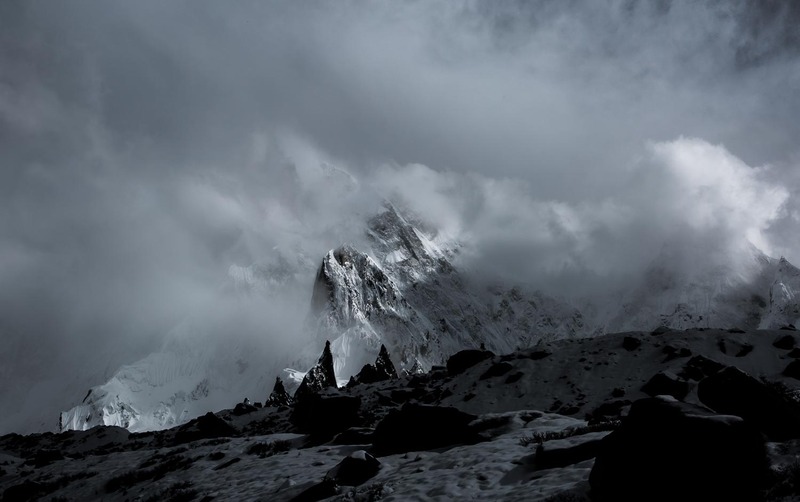 Although the avalanches are moving at hundreds of kilometres an hour, the sheer scale of the mountains in the Himalayas means they look as if they are moving quite sedately down the mountain. But this really does belie their enormous power and destructive, unstoppable force. 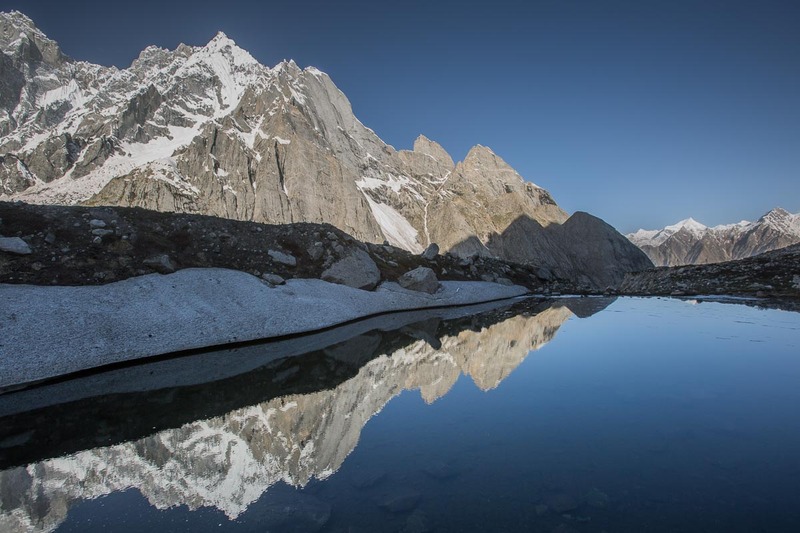 This area of Pakistan was one of the most beautiful places I have visited in the world, the mountains are awe inspiring. On one trip up in to the surrounding mountains I found the perfect flat rock to pitch my tent on and while spreading out the guy lines i noticed some huge paw prints in the surrounding snow. Although I am no expert i’m pretty sure they must have belonged to a snow leopard. I suspect the flat rock where I pitched my tent was probably a favourite sunbathing spot for this leopard. Sadly I never saw him or her, but I dream of returning to the area and trying to get some images of the snow leopards that the locals say they see regularly in the surrounding mountains. 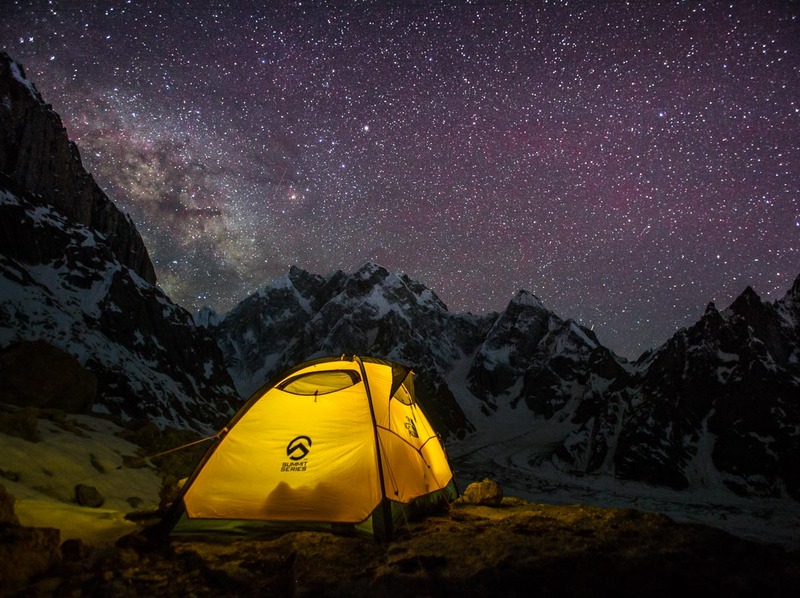 align=”right”>’Milkyway Rising’ – It was in the snow just to the left of the tent that i found the paw prints. It is an incredible honour to have an image in the exhibition at the Natural History Museum. The exhibition is open till April and I highly recommend going if you have not seen it already. If you’re not able to get to London, the Wildlife Photographer of the Year exhibition does travel around the world visiting various cities along the way so do look out for it near you. You can listen to and interview i gave to LBC Radio at the time talking about what it meant to be included in the exhibition. Great work paddy. You must be fit carrying all that kit up there in the rarefied atmosphere. Of course like all photographers I would be interested to know what camera and lens you used? but more importantly , how long did you have to stand around in the cold waiting for avalanches to occour, is there a time of the day when they happen more regularly? Hope you get your snow leopard shots!! Thank you, thats very kind. Not as fit as i should be! Thes image that mad it in to Wildlife Photographer of the Year was actually shot at 173mm on a 70-200mm lens, so i was at a safe distance from everything coming off the face! It is one of my favourite lenses and i find i gives pin sharp images which is so important for images like this where you want to a high contrast in the final image. In terms of timing, usually late morning to early afternoon is best if you have had snow fall over night. If the snowfall is a bit older then slightly later in the day is better. Really you are just trying to time it so that the snow starts to melt slightly and become unstable. For these shots i was lucky that there had been a big fall of snow so i did not have to wait long. I have just been over to your website, i love your shots of Dartmoor! I have a bit of an obsession with Bodmin Moor myself.